Deadlands was originally printed in 1996 to rave reviews and industry awards, with a revised edition only a couple years later. Fans praised it for its writing, flavor, and innovative use of playing cards and poker chips in a unique setting that accommodated both character histories and an ongoing metaplot. It won every major award the industry had to offer and then some! The success of Deadlands also gave birth to numerous licenses and spin-offs, including the Doomtown Collectible Card Game from AEG and Hasbro, Deadlands Disk Wars from Fantasy Flight, GURPs Deadlands from Steve Jackson Games, Deadlands: The Great Rail Wars miniatures game, Deadlands: Hell on Earth, and Deadlands: Lost Colony. 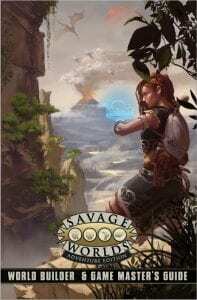 Eventually the mechanics from Deadlands morphed into Pinnacle’s current flagship, Savage Worlds, another best-selling award-winning RPG. 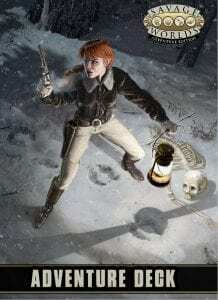 Deadlands continued under the Savage Worlds system as Deadlands Reloaded, Hell on Earth Reloaded, Deadlands Noir, and the upcoming Lost Colony Reloaded. 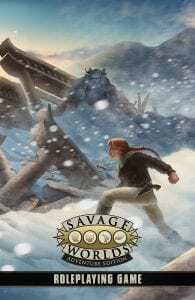 Deadlands has also been licensed for computer games, movies, novels, and comics. Now, for the 20th anniversary of this milestone in roleplaying game history, Deadlands Classic will re-release in a Limited Kickstarter Edition, full-color hardcover! The revised (and best) printing of the original black and white game has been lovingly COLORED by top artists to create the edition its creators always dreamed of. True fans of this groundbreaking game can also pledge for a VERY limited Collector’s Edition wooden “Whiskey Box”! 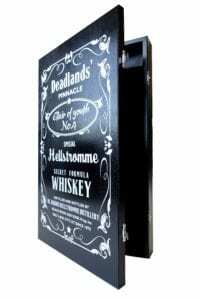 Inspired by our French partners, Black Book Editions, this gorgeous case looks like a whiskey case from the world of Deadlands, but inside is the Limited Edition full-color hardcover printing of the original game, two decks of playing cards (used for initiative in Deadlands and Savage Worlds…as well as “dealing with the devil” for hucksters), one set of themed dice, and Fate Chips! Deadlands Classic—Still Kickin’ After All These Years! Fans of Deadlands Classic are still playing this system today, including a live stream on Twitch. Want to see the system in action? Check out the EvilSqueegee channel’s Youtube videos here. Fair warning—some parts are NSFW! While fans of Deadlands Classic enjoy the new edition, those keeping up with the Servitor Plot Point Campaigns for either system will be happy to know we’re also launching the fourth and final book in the series, Good Intentions! Dr. Darius Hellstromme’s plans are finally in motion, and only the posse can stop him! If you’ve followed the events in The Flood (Reverend Grimme), Last Sons (Raven), or Stone and a Hard Place (BOTH Stones! ), you’ve GOT to be here for the big Hell-bound finale! Besides this tale of the lost and damned, Good Intentions features new Interventions for Blessed characters so they can summon forth plagues of biblical proportions or even resurrect the dead, steam augmentations from the so-called City o’ Gloom such as piston-powered arms or venomous fangs, new critters and villains, and a return to the Weird West’s favorite blood sport–Skullchucker! Best of all, the dual Kickstarter features FREE rules for converting characters and creatures from Deadlands Classic to Deadlands Reloaded and vice-versa! Use whichever system you want, partner! Fans can back one or both Kickstarter projects as they wish—shipping will be combined in the pledge manager after the projects close (shipping will not be collected during the Kickstarter itself). Pledge for one or both, add whatever you want from the rest of our Deadlands line, and combine shipping for all of it! And it’s even EU Friendly! Two Weeks. Two Kickstarters. Twice the Deadlands action. Sept 13-29th. Mark your calendar.